By Mizuho Kusanagi. Released in Japan as “Akatsuki no Yona” by Hakusensha, serialization ongoing in the magazine Hana to Yume. Released in North America by Viz Media. Translated by JN Productions, Adapted by Ysabet Reinhardt MacFarlane. This volume of Yona of the Dawn doesn’t quite reach the absolute heights of the previous two. Of course, since that downgrades it to merely “excellent”, there’s no need to worry. We start a new arc, as it turns out that one of the latest outbreaks of war is happening right where Yona and her crew are going to next. Imagine that, huh? (Seriously, there’s a wonderful self-aware moment midway through this volume where Yona wonders what her life would have been like if Hak and Su-Won had not been at odds, and she realizes she’d be a sheltered princess in the palace, not caring about the outside. Moreover, there would be no Yona of the Dawn. And so, as a reader, we are delighted that instead Yona is out and about and doing things like “Starving child? Huh. Better shoot down a bird from the sky for him to eat!” without even batting an eye. This is the Yona I want to read about. The starving kid is what kicks off the story – he’s from a village that is now part of the Kai Empire, but decades ago was part of the Kohka Empire. Shifting borders happen all the time when large nations are at war, and one of the points of this book is that people don’t care enough about the little villages along the border that are forced to deal with all this. For the most part the village has tried to stay out of the way of everyone, but that’s not going to work anymore, as, having suffered a humiliating defeat, decide that rather than let Kohka retake the land they lost, they’re going to burn it to the ground and kill everyone in it. Fortunately, they’ve got the Happy Hungry Bunch in town. Unfortunately, almost the entire group is down with a bad illness. Hak is not ill, but even he can’t take on a huge group of soldiers all by himself. Yona is fine as well, but Hak knows very well this is not a fight for her no matter how much she’s improved – the numbers are too bad. And then there’s Zeno, the last of the not-ill group, who has been, for the past several volumes, “the goofy one” for the most part, who has to fly into action after all the others (including the sick guys, who try their best but are severely underpowered) are taken down and Yona is surrounded, and… well, immediately gets a sword through the chest. Ow. Fortunately, it turns out that Zeno has a few secrets of his own, though given that it’s part of the cliffhanger, it will be till the next volume before we get to see that. There’s also a short story at the end showing Jaeha’s past with his predecessor, which again reminds us of the difficulties of being a Dragon. 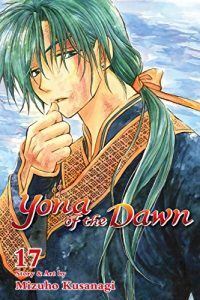 Yona is always exciting and fun (even in the most serious of scenes, there’s usually one or two asides that are hilarious – my favorite this volume being Yun’s “I know I’m a great catch, but I’m a boy.” Rest assured, this volume of Yona will keep you thoroughly entertained.